Managed Network Software for Magnum DX family of routers (MNS-DX) provides the functionality needed by industrial routers. A full range of routing software along with security and redundancy features enable the Magnum DX routers to perform efficiently in harsh industrial environments. 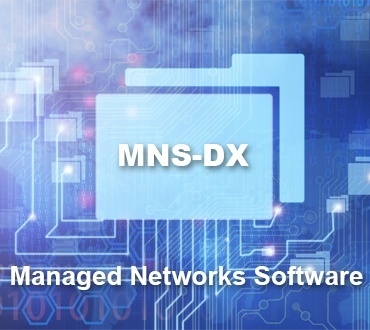 MNS-DX includes features needed to connect a variety of different devices and interface types to a routed network. MNS-DX-SECURE adds extra security features such as IPSec, VPN, firewall, encryption and authentication needed for industrial cyber security. Extra Security features are unlocked via a licensed software key. IP firewall includes address/port inspection/filtering. VPN connectivity over IPSec with strong industry standard encryption with shared keys (PSK) and X.509 certificates provide robust secure access. VPNs comply to IPSec standards and have proven interoperability with industry standard VPN devices. Management security includes encrypted interfaces multilevel user IDs with strong-form passwords and authentication via RADIUS. Serial data is encrypted using Serial SSL capabilities included in MNS-DX-SECURE. Two User Interfaces: Both a Graphical User Interface (GUI) and CLI are available. Cyber Security features: Firewall, IPSec,VPN, authenticationand encryption. Redundancy features: Routing, RSTP, VRRP,BGP, OSPF. Built-in Protocol Analyzer: Enables easy troubleshooting. RSTP (Rapid Spanning Tree Protocol), IEEE 802.1w - RSTP includes RSTP-2004. Similar to STP(IEEE 802.1d) but faster in changing interconnection direction. Used in conjunction with Magnum 6K switches for redundant rings and meshes of managed switches and routers. Industry standard compliant for interoperability. VPN - VPN provides a secure connection to another remote location over a public network such as the Internet. Magnum DX router IPSec VPN has proven interoperability with other VPN devices. VPN implementation as per RFC 2401- 2410, RFC 4302, RFC 4303, RFC 2451, RFC 3602, RFC 4868. Encryption methods include Diffie-Hellman Groups 1,2,5,14 crypto; DHE with PFS; DES; 3DES; Blowfish-CBC; AES-128; AES- 192 and AES-256. Authentication mechanisms include HMAC-MD5-128, HMACSHA1- 160, MD5, SHA1, SHA-224, SHA-256, SHA-384, SHA-512. Multiple tunnels can be setup for multiple source-destination pairs. VPN tunnels conform to the IPSec protocol. Serial SSL Connectivity - Serial Port SSL VPN provide secure communications for devices connected to serial ports.